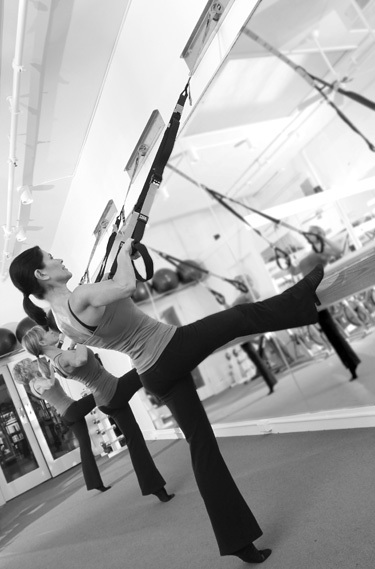 XBarre™ combines TRX suspension training with a unique barre-sculpting repertoire. Proper neutral spine, shoulder stability, thigh and bottom, and ab-firming are the key elements of this effective fun training technique. The 55-minute XBarre™ training is calorie burning and body firming workout that is followed by a fluid yoga-inspired active stretch and a mindful relaxing cooldown. Offered as Small Group Training. CardioBurn™ combines TRX suspension training with cardio interval training. Moving continuously from the TRX straps, spinning bikes, jump ropes, small steps and weights, Cardio Burn™ is a challenging total body training workout. Offered as Small Group Training. XPilates™ is a TRX suspension training combined with athletic Poised Pilates repertoire. Pilates-based movement patterns with the added challenge of the TRX system. Offered as Small Group Training.